About three weeks ago, I was swamped with work. I still am, but now I don’t feel so swamped thanks to a nice free software. It’s a multiple desktop software (or virtual desktop software, as some might call them) but this is no ordinary yet-another-multidesktop-software. It’s the best I’ve ever used, and I’ve tried so many including commercial ones. It’s called Dexpot and the one I am using is version 1.4. It’s marvelous. Really marvelous. 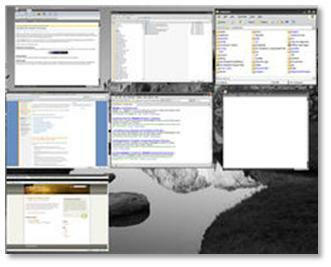 Everything you need to get you less swamped with multiple windows is there. Well, almost – it’d be much easier to actually have several monitors . Here’s aÂ rundown of the features I like. Desktop icons in the system tray. You can also use the Desktop Manager or Desktop Preview features but I don’t like the desktop clutter so I use the system tray icons instead. If you’re on Mac OS X, you know what ExposÃ© is. There are a few clones for Windows too. But lucky me, it’s part of Dexpot! I’ve assigned the Win+F2 key to it and now whenever I’m lost among all my open windows, I can easily find the one I need using visual representation. Fullscreen Preview. I can get a fullscreen preview of all desktops and click the desktop I want to switch to. I’ve assigned it to a shortcut key Win+~ just to match with the shortcut keys of my desktops Win+1 to Win+4. It’s like the one from Microsoft. Different wallpapers and desktop icons. This feature reminds me of my Norton Desktop back in Windows 95. Some other multiple desktop software has this too or at least half of it. The one by Microsoft can support different wallpaper for each desktop but it’s clumsy and the wallpapers are saved in my TEMP folder which I regularly delete. With Dexpot, it’s easy. I can just set up a wallpaper normally like in Windows and it will remember for which desktop is which wallpaper. The same with desktop icons. If I save some files on desktop 3, the file icons remain on desktop 3. Cool. I’ve been missing this feature since i upgraded to Windows 98 and Norton Desktop won’t work. I used to have separate desktops for work and play. Desktop Rules. Using this feature, I can set up rules – almost like setting up email rules in Outlook. When a particular window or application is opened, Dexpot can automatically assign it as available in all desktops or some of the desktops, set the transparency, etc. I use it so my Windows Messenger windows is available in all desktops. Hotkeys control. This software gives you a lot of control on customizing the hotkeys you can use with it. I can assign the hotkeys to viewing desktops, windows catalog, moving windows from one desktop to another, etc. In fact, almost all parts of the software can be controlled using hotkeys! It’s free! Need I say more? There are many other features but I don’t use them yet. Resource wise, it uses from around 2MB to 12MB of RAM depending on usage. It starts at around 7MB but reduces RAM usage later. Very low tax on system resources as it opens only 80 handles in my configuration. Even Windows Messenger uses more RAM and opens more handles! Give it a try. You’d be surprised with what you get for free! Get it here: Dexpot 1.4 – The utility for virtual desktops.